Welcome to Prepaid Phone News' regular Sunday Prepaid Phones on Sale this Week feature listing all the best US prepaid phone deals. My Deal of the week pick is the AT&T Nokia Lumia 635 LTE Windows Phone for $49.99 (reg $99.99) at Radio Shack. If you signup for Radio Shack emails using the form at the bottom of the radioshack.com homepage, the Shack will give you a $10 off coupon, reducing the phone's price to $39.99. If you've already used the $10 off coupon, code JINGLE10 takes 10% ($4.99) off. Even at full price, the 635 one of the best specs to price ratios of any phone available today so getting it for half prices is quite a deal. It features LTE support, a 4.5 inch 480 x 854 pixel Gorilla Glass screen, quad-core 1.2 Ghz Snapdragon 400 processor and a 5MP autofocus camera. It runs the latest Windows Phone OS 8.1 with the Cortana Voice Assistant. Amazon Online now Free shipping on orders $35 and up. BestBuy Online Now Free shipping on orders $25 and up. Sprint Prepaid: free month of service on $35, 44 or $55 plan phone purchase for new in store activations. CowBoom (part of BestBuy) Used phones with warranty. Verizon (or PagePlus) Motorola Moto G Android phone (seller refurbished) $89.99 Free shipping. Verizon (or PagePlus) Samsung Galaxy S III LTE Android phone (manufacturer refurbished) $149.77 Free shipping. Verizon (or PagePlus) Samsung Galaxy S 4 LTE Android phone (new other) $264.95 Free shipping. Radio Shack Free shipping on orders over $25. Buy two months of GSMT Service and get the third month free. This applies to only $39.99, $49.99 and $59.99 and Mobile Internet $30 and $50. Sears Online Now Shipping $5.99 unless noted. Ship to store free. Target Online Now free shipping on all orders now through Dec. 20. Get an extra 5% off with Target Red Card. Tracfone Free shipping on orders of $19.99 or more. Updated 12/26: New Frys and Groupon deals. The first 635 link is broken. There's not much to choose from if you're looking for GSM Androids. No there isn't. Most of the best deals are for Sprint based phones (Boost, Virgin Mobile and now Sprint prepaid) broken network = cheap phones. Is there any way to get two $10 off codes and buy two phones for $40 each? Can I use both the $10 off code and the 10% off code on one phone and bring the price down to $35? How much is it to unlock this phone? You should be able to get two coupons by signing up with two different emails. As far as I know the coupons are not stackable. AT&T Lumia unlocks are about $25 on eBay. Lumia unlocks cost $18.95 at US Mobile, including the required cost of a SIM card. Sprint Prepaid LG Tribute is $39.99 at Best Buy and should come with a $55 airtime card with in-store activation. MetroPCS phones that are in store only don't require mail in rebates anymore. Also phones available both online and in store can now be purchased at MetroPCS stores for the sale price without mail in rebates. With in store activation of course. Yes, in-store activation effectively kills the deal if you aren't going to be on mpcs. It doesn't make it much better than requiring a rebate. Earlier this year, neither rebates nor activation were required on the web site. Dennis. Why isn't the Verizon Moto G for $64.99 on eBay included in the Other especially notable prepaid deals list? This seems like a great deal. Does the Lumia 635 have camara flash? 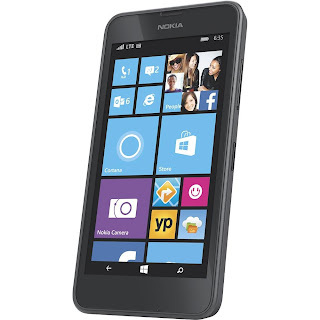 T-Mobile Nokia Lumia 635 for $68.17 @ Walmart is now ONLY available at the store level only.Sold out online. T-Mobile Prepaid adds the ZTE Zinger to their line-up. Frys Electronics has it for $28.99 Free Shipping ,No Tax. tried to buy /activate sprint prepaid tribute. coverage map for my zip code , 14468, showed blanket lte coverage. when best buy went to activate phone om sprint tech website, it showed lte service was unavailable. that confirms my previous experience with an lg f3 of almost no signal, lousy voice, and glacial slow 3g service. phne worked in other towns, but their lte speed was slower by a wide margin than my hspa+ speeds on t mobile and at&t. no wonder their phones are so cheap. so is their network. Same as my experience, but with tmobile being even worse. There is a sale going on at the BlackBerry online store. Most people don't even know that BlackBerry still exists and that their new BB10 platform is vastly improved. After having used the newer BlackBerry smartphones I don't think I can use any other phone for daily use. The Z30 phone that was produced in limited numbers late 2013 is on sale for $225. Regular price is $500. All BlackBerry phones are also able to install most Android games and apps - which takes care of the app-gap since Blackberry App Store is not very great. If anyone wants to try out a clean and uncluttered OS that is specially optimized for high productivity then you ought to try one of the newer BlackBerry phones - especially the Z30 5" all touch on sale. Someone willing to spend more ought to try out the new flagship phone - the BlackBerry Passport. Both the Z30 and Passport boast of a battery that lasts more than a day on moderate to even heavy use. Does BB run Android apps more than poorly? I had trouble finding reports, it does more than that. The Passport's keyboard is a standout feature: better than the painfully small previous BB keyboards, and of course a feature that other modern smartphones suffer for the lack of. The android apps run decently enough. Especially on the Passport they are very quick. I have the Z10 currently and use several apps like PayPal, bank app, Google Maps, Montano Reader, Amazon app etc. They run pretty well - I would say on par with mid level android phones but these same apps are supposed to run better on the Z30. Most of all, once you learn and get used to the BlackBerry's touch keyboard and understand how to use custom word replacements - you just can't go back to any other touch phone. Check out CrackBerry.com for reviews and stuff. It looks like the sale page phone specs do not match its detailed specs for LTE bands. The detailed specs are for the international version. Probably should verify that US bands are supported before ordering. The touch-keyboard was a cost-saving shortcut, a compromise. A design mistake by BB (hoping to save a few bucks on the handset), which fortunately they rectified with the Passport. I'd rather other smartphones copied the BB Passport, with a usable keyboard, than BB copy other smartphones, go down to their level, and ditch the always-better-working hardware keyboard and force BB users to specter fork cup notion Betty. The STA100-5 model is all that is being sold. It's fully compatible with T-Mobile and and also covers most - but not all of AT&T LTE Bands. I am on AT&T and have ordered it today.